The best dog food is not necessarily the same for every dog. There are so many diverse opinions among Veterinarians as well as pet owners as to what dog foods are the best choices. Much depends on your dog’s age, breed, activity level, lifestyle, and taste preferences. So what is a responsible dog owner supposed to do? Fortunately, consumers today demand to be informed so there are many high quality choices available. Actually, this abundance of choices is what has many dog owners confused. There are so many dog foods in the market, how do you know which one to select? How can you tell if you’re buying healthy dog food? As a rule, supermarket dog foods are not the best quality and should be avoided unless you are diligent in reading and understand the labels. Check labels to ensure your dog is getting high quality ingredients without additives and preservatives. Choose organic dog food or natural dog foods whenever possible. A natural pet food can’t contain any chemically produced ingredients other than vitamins and minerals. Become a detective and do testing to determine which foods are better for your dog. Is his coat shinier, is he eliminating regularly, is he full of energy and vitality? Just like humans, food plays a huge role in your dog’s health and vitality. Avoid meat byproducts which contain empty calories and don’t provide real nutrition. Stay away from dog foods which list corn as a main ingredient. Corn doesn’t provide adequate nutrients and is also responsible for allergy conditions for many dogs. Ensure your dog eats good fats which are necessary for healthy skin, coat, and brain function. Good fats include chicken fat, flax oil, sunflower oil, herring oil, and canola oil. Food should include whole grains such as rice, oats, barley, millet, potatoes, and sweet potatoes. Don’t cancel out the good nutrients of these high quality natural dog foods by feeding your dog unhealthy table scraps. The higher price of choosing the best dog food outweighs the cost associated with health concerns and Vet visits. Just like humans, what we feed our pets is directly related to their health, happiness, and overall well being. If you've been to a pet store lately, you know that there's a huge variety of food with a variety of ingredients in a variety of brands. It can be so overwhelming that you may just grab anything in order to avoid all the choices. 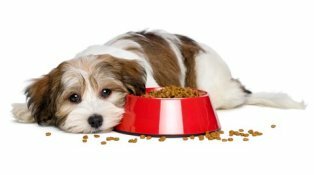 Unfortunately, many types of dog foods are processed and contain very low nutritional values. These foods are detrimental to your dog's health and can result in numerous medical complications further down the road. The best dog food is a natural dog food that isn’t chemically produced. Protein is the most important ingredient for your dog’s diet, so you want to purchase items that use chicken, lamb, beef, or other protein as the main ingredient. Avoid the products that have by-products listed as an ingredient as these are the empty calories most processed foods use. These by-products are generally the heads, necks, stomachs, organs, and other waste materials that companies use to bulk up meals. Other items to be aware of are corn and corn products. The best food for dogs contains very little to no corn. Corn is used to keep the price of dog food reasonable while maintaining protein levels. However, corn has very little nutritional value and, more importantly, it is the cause of many dog skin allergies. Itching, licking of the feet, ear infections and general sense of discomfort are all present in dogs that consume high levels of corn in their diet. Other foods commonly associated with dog allergies include soy, beef, dairy products, canned tuna, wheat, yeast, preservatives, and eggs. 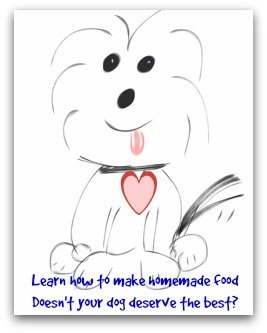 More and more people are turning to homemade dog foods to have control over the ingredients their dogs are getting. Not sure what to prepare for your dog? Check out these recipes - you'll find over 200 choices that are easy to prepare, economical, and healthy for your dog. Above all, be mindful of what you feed your dog to ensure a long and healthy life that you both can enjoy.